I am trying to set up Nextcloud Notes. When entering my disroot credentials, I get an error "Invalid login: Wrong username or password". The credentials I used are the same as the ones I used to login to webmail. Did I make a mistake or is there another issue? works fine here. just checked on my phone (un-installed notes, installed and set it up from scratch). must be indeed wrong user or password. 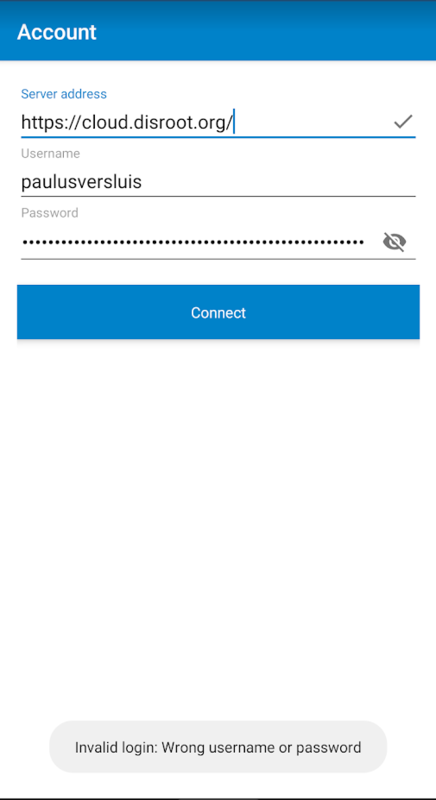 if you open a browser in private mode and try to login to https://cloud.disroot.org does it work? also maybe the last slash in url causes issue though i dont think so. second thought that comes to mind, are using two factor authentication for cloud? if so you need to create app password for notes in the settings. also providing invalid credentials more then 6 times will get your IP blocked for 15 minutes. That was it. I have just created a new app password for notes and used that one. It works. Thanks!